McMillenville is a ghost town about 20 miles north of Globe. 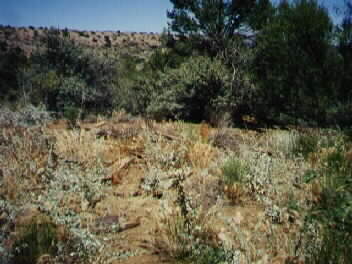 This was where Billy the Kid first became a cattle rustler, and a true outlaw. 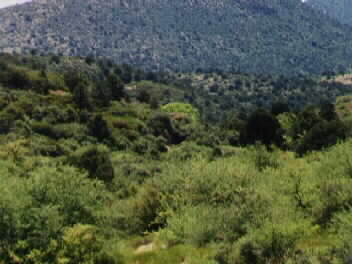 It is also the site of one of the richest silver mines in all Arizona history--the Stonewall Jackson mine (located directly in the center of the photo, underneath the bright green tree, hard to see, but discernible). Some individuals who once lived here told me, personally, some of the fascinating history of this site. If any place deserves the name "ghost" town, this place certainly does. These are the remains of Patrick Shanley's store in McMillenville. He was an old prospector who did pretty good for himself. He is buried in Globe. Shanley's store later became a rancher's shack. One old guy lived there some 45 years of the 20th century. I guess he expected that some day the "mine would come back." I don't recall his name, but I have his story somewhere in all my voluminous notes.